ESO at QuakeCon 2014 – Good News for Player Guilds! ESO Friends, we just had to fill you in on some of the fantastic news from Elder Scrolls Online (ESO), that you can benefit from with Player-Guilds! We will start with quick review of what good things will not change, and tell you what new wonderful things are highly exciting for Player-Guilds! Player Guilds are made by the players themselves, for the purpose of having ingame allies, social support, grouping with friends and/or making new friends; and also for allying, trading and helping each other. ESO (with their August Update Three), have some more fun in store for players who belong to Player Guilds. Player Guilds help you to have allies to group up with for playing, exploring, and questing, looking for Skyshards or Lore-Books together, gathering guild mates for the PVP Trials or going to the Alliance Wars in Cyrodiil. Either the guild you create or some of those you may belong to, may also want to fight in the Alliance Wars, to capture keeps or to try to go for the Elder Scroll and the Emperor’s Crown. Yet, what if your Player-Guild wants an enhanced unique identity to share together for that guild? Well, ESO is granting that wish! Let’s talk about some of the exciting additions and changes that will be coming with the Update 3 announced by the ESO Devs at QuakeCon 2014. Besides the ESO Devs promising that the Update 3 improvements will allow players to personalize their characters in new exciting ways such as dyes for coloring armors — it also allows Player Guilds to form unique identities with the help of its introduction of customizable Guild Tabards! Some more good news is that, extra armor-dyes with the ESO Update 3 can be earned via your player achievements, but once you unlock a dye-color it is saved to your account for use with all your player characters, regardless of which of your player-characters (or alternates) unlocked the color. It is free to change your look of your armor and clothes at any of the new dye stations you’ll find in the ESO ingame-world. When you are done reading here about Guild-Tabards and other new features, feel free to check out the dying guide by our fearless leader Ambuaz, called; Armor Dyes — Customize Your Gear! Making Guild Tabards is not tied to individual achievements like extra dye colors are, as Guild-Tabards are available via Player-Guilds. A Player-Guild only needs ten (10) or more members to be allowed to design this kind of unique heraldry for their player-guild for members to wear with pride. which can potentially be used in the creation of Guild Heraldry Tabards! A player-guild leader can use any of the available colors, tabard shapes, and crests when making a tabard; without needing to unlock any of them! Once created, the Guild Leader of your player-guild can offer the official Guild-Tabard for all its members your armors can even be dyed to match the tabards, if desired. A Player Guild is still allowed a starting Guild Bank of 500 Slots, once enough players have joined that guild to make a total of at least ten (10) players belonging to that guild. It’s a good idea to recruit more than ten members to your player-guild, so that your bank does not close if your membership dips below ten again. Sometimes Guild-Banks are used for storing prizes for Guild Contests, and/or for Alliances Wars, and some banks are used for giving or taking anything in there anytime, depending on the guild. The Guild Master and/or Guild Officer will initially decide when the Bank is ready to be opened to which ranks and when, and they may choose to wait to open it to all, until they have enough players joined to be able to open the Guild Store. This allows participants in the Guild the opportunity to unload items by selling them in the Guild Store at the prices of their own member’s choosing, instead of clogging up the bank, (especially with duplicates of multiple unstackable unwanted items). However, a major change coming with Update 3 for the Guild-Bank is to try to make them more User Friendly and with better stacking ability of duplicate items via the New Improved Guild Bank Management system that players had been hoping for. Regardless of how a Guild’s Banks permissions are set at any given time, or how the bank is used for any given player -guild — those who have not joined a Player Guild still cannot deposit or withdraw from that Guild Bank – however improvements to the Guild-Stores and the addition of many New Public Guild Store Locations can help guilds get their Player-Guild and their Guild-Stores out to many more people. For your Player-Guild interface ESO Update 3 introduces New Customizable Guild Ranks (and icons you can choose for each rank) and permissions. This will be fun for your guild, as you can customize these to your own player-guild’s theme too if you want. All the NPC Guilds (and their quests and skill lines) are still per player character and the player run guilds (Player-Guilds) are still allowed up to five player-guild memberships per account. So each player-account can still be a part of (five) 5 guilds, including the guild they created and four other guilds created by others. Your main character and any alternate characters in your account will belong to and have access to all five (5) guilds and their stores, if they have stores. You are able to put 30 items up for sale at any given time, in each of those guild stores whose guild you belong to. So if all of the guilds you belong to have enough members (over 50) to have stores and do, then you can potentially buy and sell at up to five guilds at a time. So if you sell up to 30 items in each of five guilds, you can potentially have up to 150 items up for sale at any given time, although if you belong to fewer guilds or some of your guilds are under 50 players in membership (and so do not have a store yet), it will be a bit less of course. Do not worry, after Update 3 if a guild-store closes or you have to leave a guild for any reason, or some of your items do not sell within 30 days; those items will still be automatically returned to you from that guild-store via ingame mail. You can then decide to relist them at different prices at the same guild-store or in a different guild-store, as the situation warrants it. However the Update 3 gives your Guilds more ways to promote their Guild-Stores for more buying, selling and trading options. Guild Leaders and Officers generally want to promote players that show positive interest in the guild, group with other members to play, and help other players in the guild when they can. Since each Guild has to pick a particular allegiance in the Alliance Wars (even if they allow members from any alliance) if you claim a Keep in The Alliance Wars playing for a particular alliance with your created guild or a guild you belong to – you can claim a keep for that guild! Some Player-Guilds even offer prizes for such outstanding guild-players, even though you may be doing it for your friendship and loyalty to your player-guild, as you wear your Player-Guild Tabard with pride. If either the Player-Guild you created or any that you belong to have a guild store then anyone in those guilds can still have access to buy and sell items — and if the Player-Guild has a shop in a Keep in the PVP map then it has a Public Player-Guild Shop there for all who able go there too. However, if you have alternate characters on your account as many people do, some of which belong to different alliances than the guild you created for your main character — you still cannot create a guild of your own in each alliance, but you can potentially play those alternates in a different alliance by joining somebody else’s guild for each alternate character’s alliance, without changing the alliance of your own one guild you already created. Evenso, the PvP Keeps that you capture with a particular alliance are controlled not by an individual, but by the guild of your choosing in that alliance when and if you do manage to capture them. The Keeps you capture and claim for the same guild you picked, are under the control of that guild thanks to your help. Your player-character earns PvP Points in the PvP Ranking and currency, and the Keep is controlled by the guild of your choosing once you capture it, and that player-guild can set up a public shop at that Keep, so that everyone can buy from them as long as they hold that Keep. With ESO Update 3, ESO adds many, many more New Public Guild Store Locations! So besides more available Public Guild Stores, that also means that there may be easier access to your Public Guild Stores by more players, when you gain them. Even more Player-Guild fun via Update 3 comes with New NPC Traders scattered throughout Tamriel, which Player-Guilds can bid on to sell goods from their own player-guild stores to the public! Over 120 ‘Guild Traders’ from the ‘Gold Coast Trading Company’ will be distributed at convenient locations (usually near a Wayshrine), throughout Tamriel and your Player-Guild has a chance to bid on one each week. Wouldn’t it be fun to see a Trader out in the world, wearing your Player-Guild’s Tabard? Now here is where it gets even more fun – if your Player-Guild wins the bid – That ‘Guild Trader’ can be wearing YOUR Player-Guild’s Tabard in the world whilst selling your player-guild store’s wares! Also all players on your megaserver will see your trader wearing your player-guild’s tabard, and your player-guild’s name at that location. Besides more fixes and additional fun, other new features you and your player-guild mates can enjoy in ESO after Update 3 are the New Difficulty Mode for Trials, New Campaign Types, Larger Coldharbour Delves, and the New Craglorn Armor and more! Alert! Good News about respec! Respec is redistributing your skill points, (which was considered by many players to be too high-priced before). Nick Konkle, Lead Gameplay Designer, reportedly responded to a QuakeCon question on it, revealing that — ‘For the first week of update 3, ESO will make respec extremely cheap (i.e. 100 gold)! After that ESO will reduce the respec cost by 25%. ESO will also add in respec for just your morphs that is really cheap (100x cheaper than a full respec)’, (Konkle, 2014). YAY! So be sure to tell your friends, that if they have wanted to respec, a really good time to do so is for the first week of ESO Update 3 in August 2014! We hope this guide has helped you get some good news on NEW ESO FEATURES – that you can look forward to enjoying with more fun experiences in your ESO Player-Guilds. Congratulations to ESO for a great showing at QuakeCon 2014, and many thanks for listening to your players! 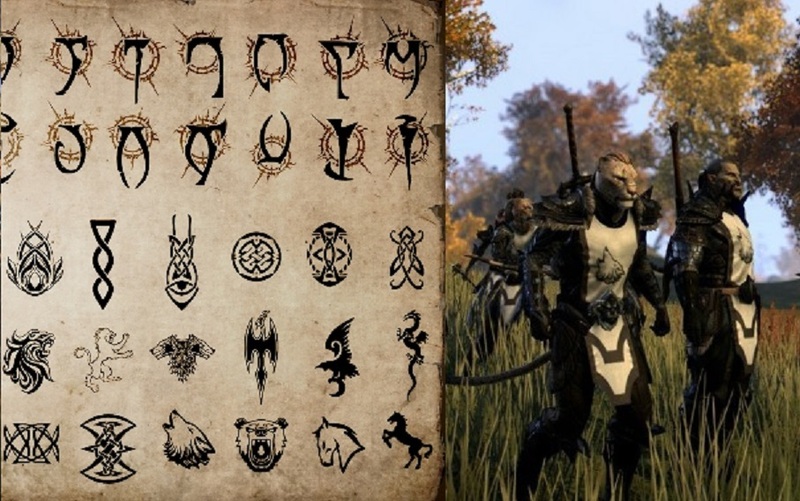 ESO Friends, we are really looking forward to seeing all the new ESO Player-Guild Heraldry ingame! Hope to see you there! Please feel free to leave any comments or suggestions for other players, and feel free to tell us about some of your best ESO Player-Guild experiences. From, Apple.Snowsong of STORM-CATS, and all of us here at ElderScrollsOnline.Info — Happiness on you All!